Preschool planning for a new school year can be overwhelming at first. It’s often helpful to break the planning process down into manageable parts. This helps to direct the focus of the planning, and it also ensures that all important aspects of the preschool year are taken into account. Preschool Planning – Where to Start? We recommend starting with a broad, overarching look at the preschool year. This will help you take a step back and look at the big picture and break it down into tasks within each month of the school year. Begin with a blank annual planning sheet on which to record your notes and plans. You can put one together on your computer or in writing in your teacher planner. Alternatively, you can edit and print our free annual planning sheet. Whichever method you choose, just be sure to keep the annual planning sheet in a safe place as you’ll be referencing it throughout the year. We recommend adding it to the front of your teacher planner. If you work in a private or public preschool classroom, your school likely has an annual calendar in place. If you run an in-home preschool classroom, you’ve likely developed your own calendar of events. Take a look at all of the important dates throughout the year. Notating all of the applicable dates on your annual planning sheet is the first step in mapping out the year. If you have your students’ information already, be sure to add their birthdays to the planning sheet, too. It’s helpful to have all of the important dates in one place while planning. Other ideas to add each month might include special classroom days. It’s fun to add days like Pajama Day or Water Day into the preschool year. Depending on where you teach, you may have learning standards that guide what you’re teaching. Your administrator will likely have a copy of these standards, and your department of education will as well. Most of these standards can be found online, and they can be a handy resource when drafting your preschool plans for the year. Please note that some of the preschool learning standards may only be written for children in pre-kindergarten programs (ages 4 to 5). If you teach younger preschool children, it will still benefit you to know what is expected of the pre-k children. If you don’t have access to such teaching standards, we suggest you draft learning goals on your own. Draw from your knowledge of early childhood education, as well as your background in teaching young children. In the future, we’ll be sharing a comprehensive list of learning goals to share with you. Once you have a feel for the preschool learning goals, it’s time to break them down using your annual planning sheet. Add the main learning goals where you find them best applicable. For example, if one of your science learning goals deals with the concept of recycling, April might be a good month for that goal because of Earth Day. That doesn’t mean you won’t teach the concept at other times. It just means that you will focus on teaching it more in April. We both love using themes in early childhood classrooms. They’re fun and engaging for the children, and they enable children to discover and explore a lot about different concepts. For more ideas related to thematic teaching, be sure to check out Fun-A-Day’s preschool themes and Fantastic Fun and Learning’s themes. When it comes to thematic preschool planning, there are two general schools of thought. On the one hand, some teachers like to map out the entire year’s themes ahead of time. On the other hand, some teachers prefer to wait until they’ve met their students and found out some of the students’ interests. We like the idea of planning for the first few months of school ahead of time. Then, after spending time teaching the kids, mapping out the rest of the year. There are pros an cons to each, so do what works best for you and your students. Once you’ve added dates, learning goals, and themes to the preschool planning sheet, the year is almost all mapped out. Now it’s time to decide if you will incorporate any special projects into your preschool year. If so, be sure to make a note next to the months when these projects would take place. Additionally, it’s a great idea to decide ahead of time if you will send home a preschool portfolio at the end of the year. If so, planning for it each month will make the entire process easier. Some teachers like to keep a piece of artwork from each month to include in the portfolio. Others include photos, writing samples, hand print art, etc. That’s really up to you! Be sure to check out Fun-A-Day’s preschool portfolios for some inspiration. We like to note each month’s portfolio idea on the annual planning sheet, as it just streamlines the process. The next part of the planning process is monthly planning. 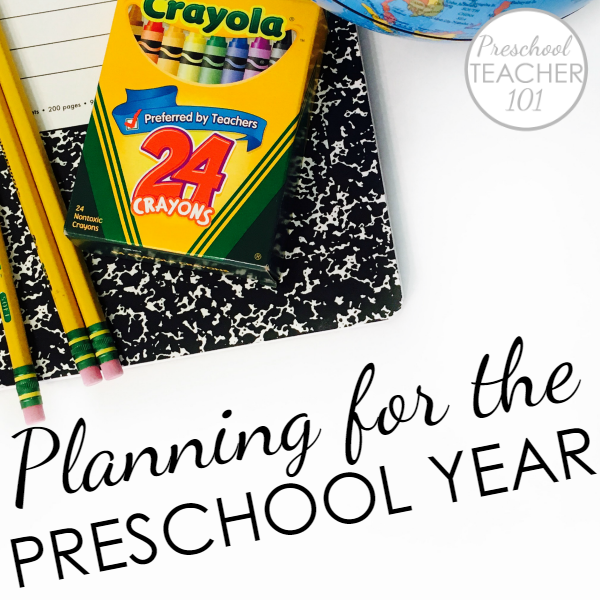 Hop on over there and read about the next aspect of planning your preschool year. 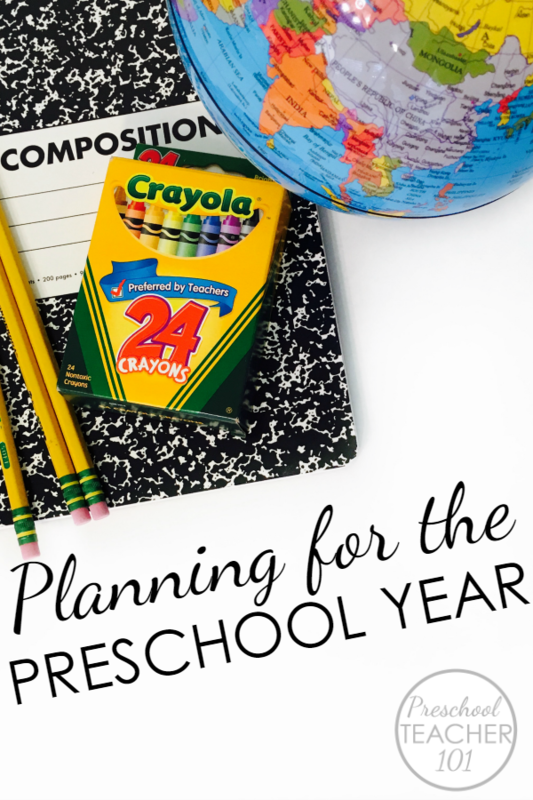 Do you feel ready to dig into your preschool planning for the year now? If you haven’t done so already, be sure to download your free annual preschool planning sheet. It’s broken down into all of the areas discussed above, but it’s editable so you can adjust that based on your needs. Print it out and fill it up with all of your plans, or you can type everything directly in the template since it’s an editable form. It’s a blank canvas just waiting for all of your amazing preschool plans! It’s editable, so you can customize it with your own plans, print it out, and be ready to go.